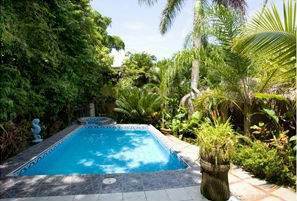 This small, family-oriented hotel is ideally located right at the entrance of Manuel Antonio national park, and 2 minutes walk to the beach. There are over 150,000 visitors to this national park every year, and each of them must pass directly in front of this hotel. This is evidenced in the hotel’s occupancy rates, which have averaged over 80% year-round. At the current nightly rates, the hotel is netting over a 10% return on the asking price. There is also a small restaurant (licensed) on the premises, a pool, jacuzzi, sunning deck, and barbecue area. The southern boundary of the hotel borders the national park, and therefore it is a common sight to see monkeys, sloths, iguanas, deer, agouti and other wild animals meander onto the property. Lastly, this hotel is rated #1 on trip advisor, and has fantastic reviews in numerous guides!